^ Babrauskas, Vytenis. Ignition Handbook. Issaquah, WA: Fire Science Publishers/Society of Fire Protection Engineers. 2003: 453. ISBN 0-9728111-3-3. ^ 2.0 2.1 2.2 2.3 The B-41 Bomb. [2013-03-27]. ^ Ackerman, Spencer. Last Nuclear ‘Monster Weapon’ Gets Dismantled. Wired. October 23, 2011 [23 October 2011]. ^ Norris, R. S.; Arkin, W. M. known nuclear tests worldwide, 1945-1995. Bulletin of the Atomic Scientists. 1996年5月: 61–63. ^ The MK-41, or B41 when given its bomb designation, was ...the most efficient bomb or warhead actually deployed by any country during the Cold War and afterwards. http://www.ieri.be/fr/publications/ierinews/2011/juillet/fission-fusion-and-staging. 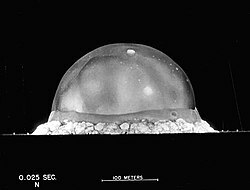 ^ Trinity Test, July 16, 1945 Eyewitness Report by Enrico Fermi. [2013-03-27]. ^ Taylor, G. I. The Dynamics of the Combustion Products behind Plane and Spherical Detonation Fronts in Explosives. Proceedings of the Royal Society of London A. 1950, 200: 235–247. ^ Analytical mathematics for physical understanding, versus abstract numerical computation. [2013-03-27]. "General Principles of Nuclear Explosions", Chapter 1 in Samuel Glasstone and Phillip Dolan, eds., The Effects of Nuclear Weapons, 3rd edn. (Washington D.C.: U.S. Department of Defense/U.S. Energy Research and Development Administration, 1977); provides information about the relationship of nuclear yields to other effects (radiation, damage, etc.). "THE MAY 1998 POKHRAN TESTS: Scientific Aspects", discusses different methods used to determine the yields of the Indian 1998 tests.